Manicure: China Glaze Aquadelic from the Electropop Collection. Bright, Neon-Toned Turquoise. Not A Dupe: Aquadelic looks very similar to China Glaze’s incredibly popular For Audrey, but it is not a dupe. On the nail, Aquadelic has more green undertones, and is far brighter and neon-based than For Audrey; whereas For Audrey is more of a mint-leaning shade, that is dusty / baby blue based (like the Tiffany & Co. color it was named for). How To: For this manicure I used one coat of Essie's First Base Coat for adhesion; two coats of China Glaze’s Aquadelic; and one coat of Seche Vite Dry Fast Top Coat. Notes: Aquadelic has an incredible formula. The consistency was perfect, and super simple to work with; and the color was basically entirely opaque after one coat (I did two just to be on the safe side). I am amazed at the lasting power of this color. I wore it for seven days, experienced 0 chips, and the color never dulled. Another thing to add is that China Glaze polishes have incredible tip-wear, and Aquadelic was no exception. If you like turquoise / teal colors, you would love this. Accessories: Pieces Jorie Shop Ring (the starfish) via ASOS. Forever 21 Floral Butterfly Ring Set in Peach / Ivory (the stackables). I've been wanting a color like this. So great to hear about the tip wear on it too. Lovely! Love your tips too. What a great rings! So LOVE your pics. Great color. I'll have to try this brand. I was wondering about this product. I really liked this color. What a great Monday post! So pretty. I love this shade. Oh, so nice. In love with those rings, too. Hi... Love your blog and have been visiting for a quite a while. Now I am following you and would love it if you would visit me and follow back! Thanks you. Lovely shade of aqua/green/blue. I think that the ring suits the color very well. And I love that starfish ring! Thanks for the review! I splurged on Chanel Coco blue at the airport and would love to compare it to Audrey now! So want it and need it! That is such a great shade of turquoise polish. I use essie's turquoise and Caicos but inlike how this colou is a bit more blue & neon. Lovely starfish ring too! WOW This is amazing! Really love these nails! Okay, can you just come over here and do my nails? I love the color, I really love blue-green's for summer. Love this color. It is perfect for summer beach weekends! As soon as you said Tiffany's, I totally saw it. This polish definitely reminds me of the Tiffany color. Also, you always have the cutest jewelry--love that starfish ring! That's such a gorgeous colour. I love how bright it is. oh very pretty. that's awesome you had no chipping for a week. i'm not wearing anything on my nails, but i hope to add some purple to my toes! I really need that color! And that star fish ring? HEAVEN!! I need to buy this color ASAP. It's absolutely gorgeous. that starfish ring kills me. it's SOOO pretty! seriously! I just love it. And it goes perfectly with the turquoise because it's all kinda in the "beachy" family. Gorgeous, gorgeous! Love this color! So perfect for the season and that starfish ring! Oh what a gorgeous color!! It just says Summer! Erika, not sure if my comment went through. I love this color, it's so beachy and looks perfect with that starfish ring--love! I love so much you're blog. I follow u. 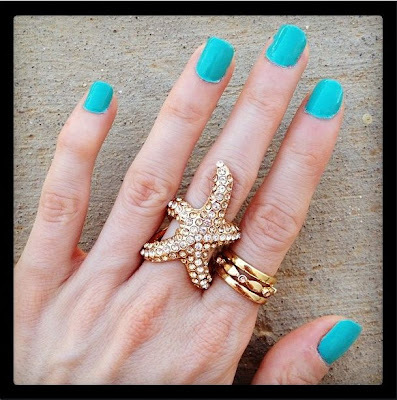 Love the color but so in love with the starfish ring! So awesome. Love the pairing of turquoise and gold, so summery! Also, that starfish ring is amazing.